Seems like London will be kicking off the new year in style. Musicalize, a UK based event company will be holding another amazing concert in January 2014. The team who put together concerts with the likes of Brandy, Ciara, Ed Sheeran, Wretch 32, and most recently Lil Kim and Eve are back again to give fans a real hip hop treat with this Allstar line up. 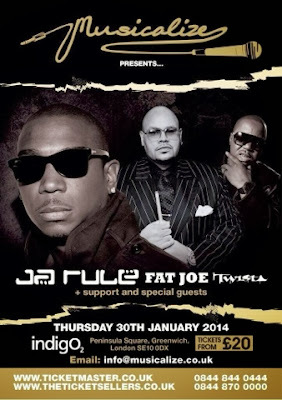 January 30, 2014 will see Ja Rule, Fat Joe and Twista all take the stage at London's IndigO2, performing their greatest hits as well as new releases. Still to be confirmed who from the UK will hit the stage with them, the night is looking very promising so far nevertheless. Furthermore details about the concert and tickets below! This is a concert that you do not want to miss out on. Tickets are priced from £20 and can be purchased via TicketMaster, AXS and other usual online ticket outlets!